personalized service and attention to the smallest detail. Lodge staff are passionate and committed to making your dream African honeymoon a reality that will be cherished for a lifetime. Candlelit dinner on your private deck at Savute Safari Lodge Enjoy a romantic dinner for two on Xugana Island’s famous floating deck, under the diamond studded skies over the Okavango Delta. A memorable tree planting ceremony where you will plant your own tree. A plaque with your names will be placed on the tree. Upon your arrival at Livingstone or Victoria Falls Airport, you will be met and welcomed by a representative from Chobe Game Lodge. You will be transferred by road to the Lodge, where you will spend three nights. Experience this legendary lodge made famous by Richard Burton and Elisabeth Taylor who celebrated their second wedding at Chobe Game Lodge. After settling into your luxurious Honeymoon Suite, you will have time to freshen up and relax. Enjoy a delicious lunch served on the terrace restaurant overlooking the Chobe River. Set out on your afternoon game activity – a sundowner cruise on the magnificent Chobe River or an exciting game drive exploring the Chobe area. Sunset Cruises are spectacular as you will be able to view wildlife that congregates at the water’s edge and enjoy a spectacular African sunset. skies, explaining the stars while sharing local folklore. 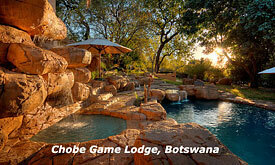 large swimming pool, a stylish cigar bar with an outside terrace overlooking the Chobe River. 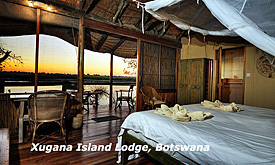 Chobe Game Lodge also has wildlife reference library with lounge and terrace. knowledge of the Savuti area. 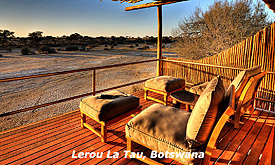 private viewing decks and en-suite bathrooms. cocktail on the viewing deck. African night as you enjoy your delicious meal. light aircraft for your flight to Xugana Island Lodge, where you will stay for two nights. concession, Xugana is a true water -based camp. the centre of the island is a perfect place to relax. lagoons and islands in the concession. 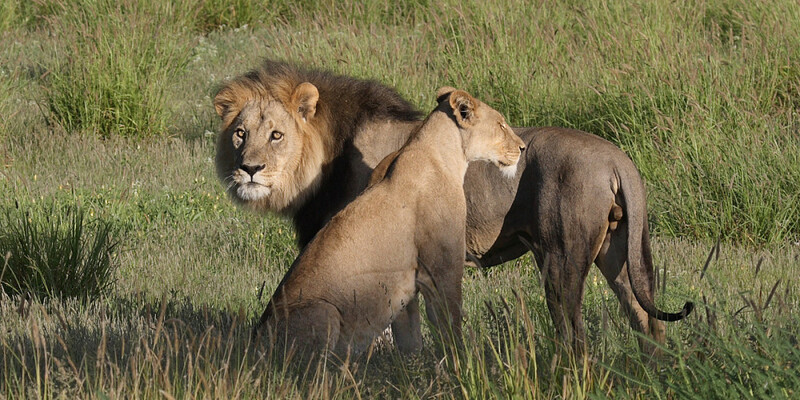 leave you with everlasting memories of the Okavango Delta. location of Leroo La Tau, where you will spend two nights. opportunities for spectacular wildlife sightings from this raised vantage point. and the sweeping scrub and grasslands of the Makgadikgadi. views over the dry riverbed and grassy plains. 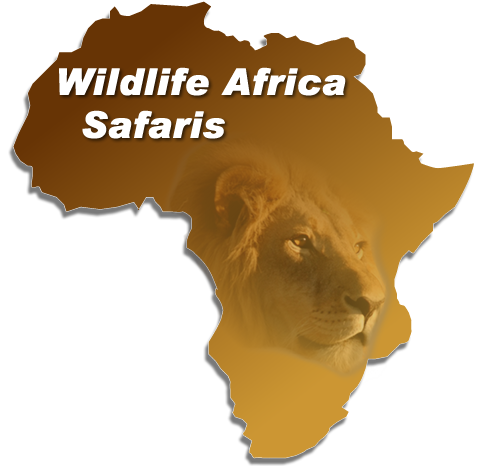 Leopard, Cheetah, Brown and Spotted Hyena and maybe even the rare White Rhino. Africa – for present and future generations. 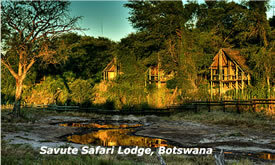 the promise of a return journey to Botswana ever close to your heart.